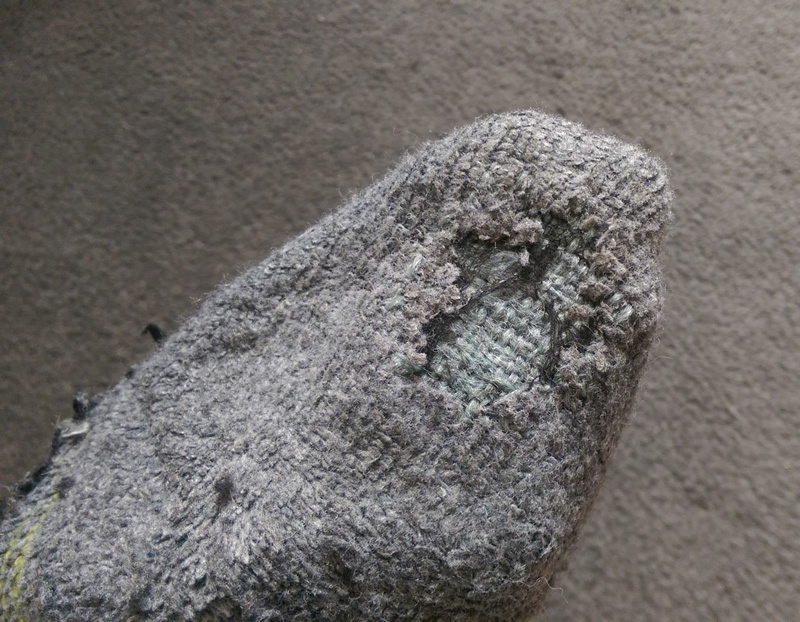 You don’t really hear much about darning socks in this day and age because they’re usually so cheap to replace. I’ve always been curious about it though (too much reading of classic literature), and recently my interest was revived by Katy of Misericordia. 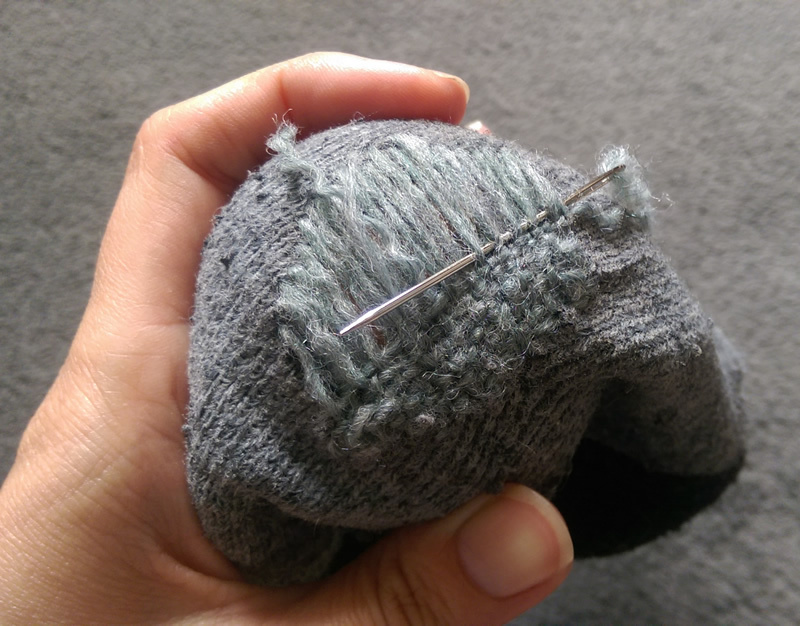 I’d actually got halfway to starting some darning last year when I saw a ‘how to’ in a magazine, and my partner gave me some of his much loved socks to repair… but then I put them away in a cupboard and forgot about them. 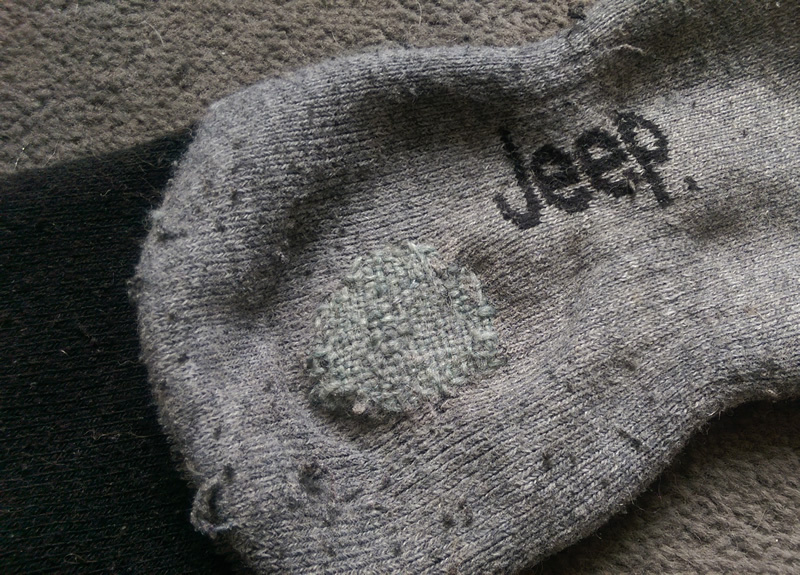 I came across the socks again this past weekend and as I’m off sick at the moment and not supposed to be doing anything too strenuous I thought I’d finally give it a bash. It was surprisingly easy, and oddly relaxing! 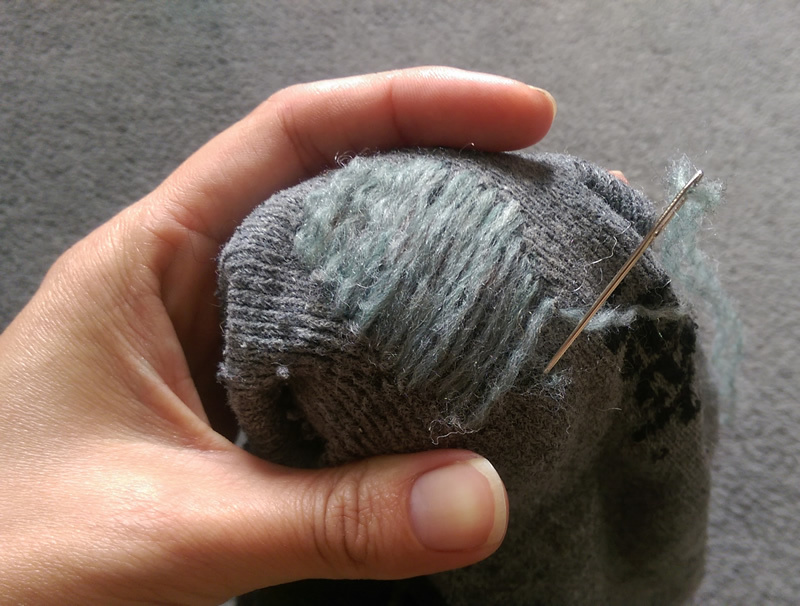 The first job was to find some suitable thread. 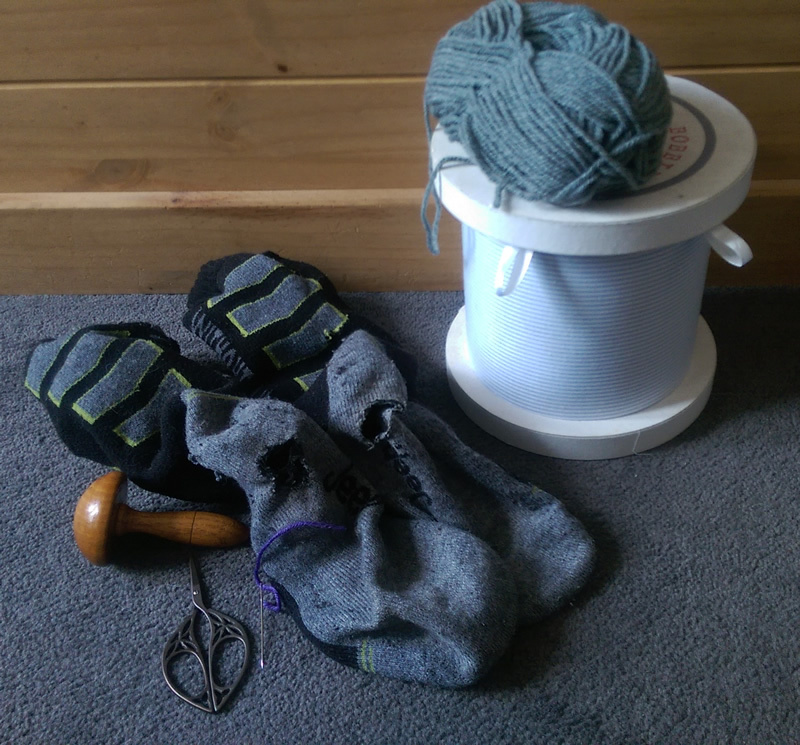 As the socks are quite thick I wanted to use yarn, but none of my yarn was quite the right thickness. 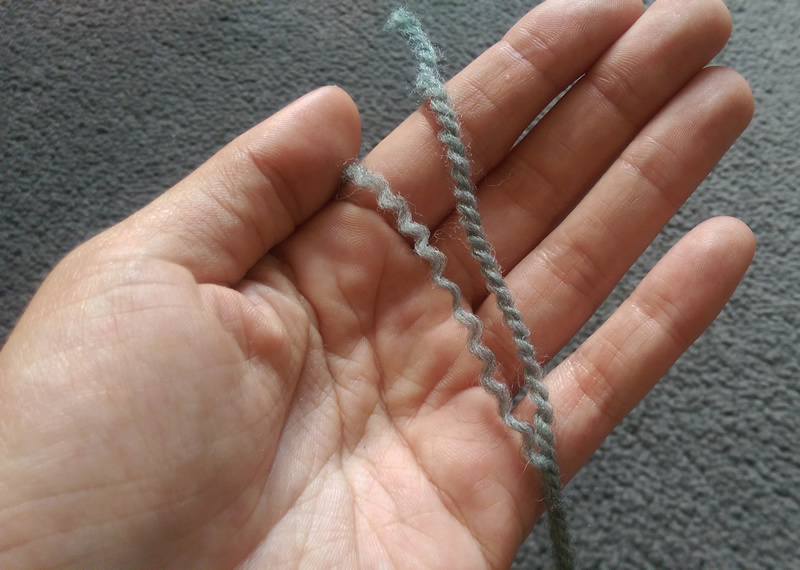 So I found some grey acrylic that was a reasonably good match colour-wise and then split it (as you would do to embroidery thread) to get three strands. 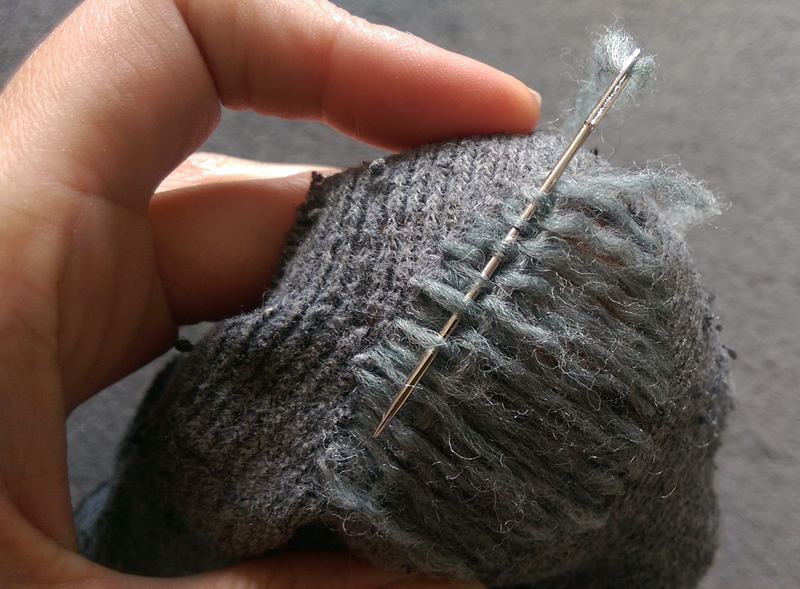 …then started going the other way, weaving in and out of the threads I’d just sewn. If you’re giving this a go then remember to start your threads a decent distance from the edge of the hole so that they’re anchored firmly. 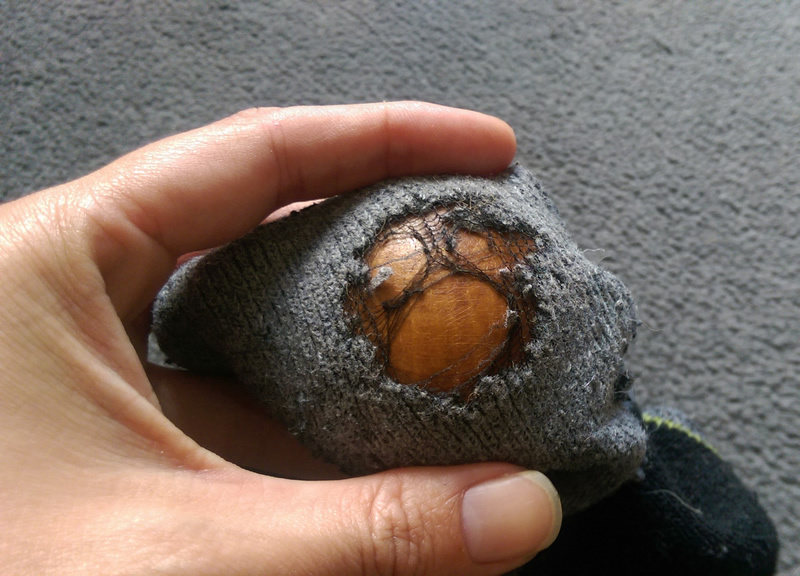 So there we go, my first attempt at darning socks! 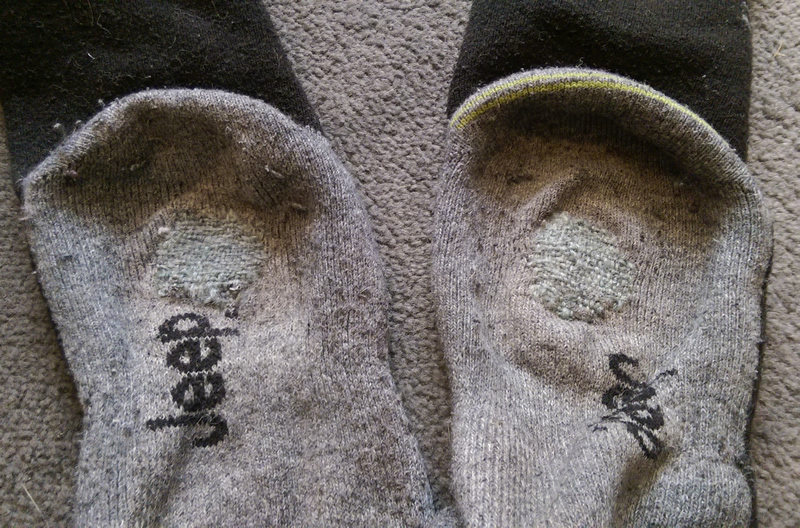 I will definitely be doing this again (there’s already another pair waiting for me…), but I think I’d only bother with expensive socks as it really isn’t worth it for bog-standard cotton ones. 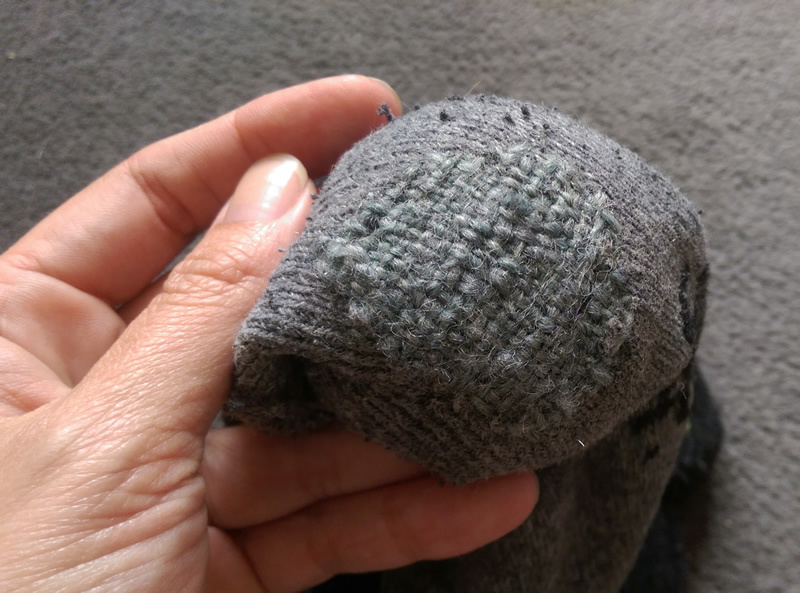 Matt’s worn these already and says they’re comfy and he can’t feel any difference so I think I got the thread thickness right, which is especially satisfying. 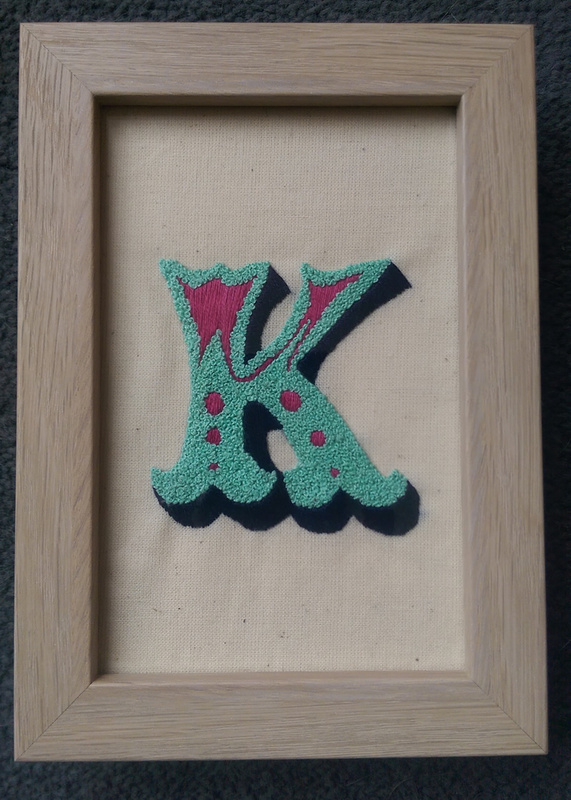 Another commission, this one an embroidered letter. 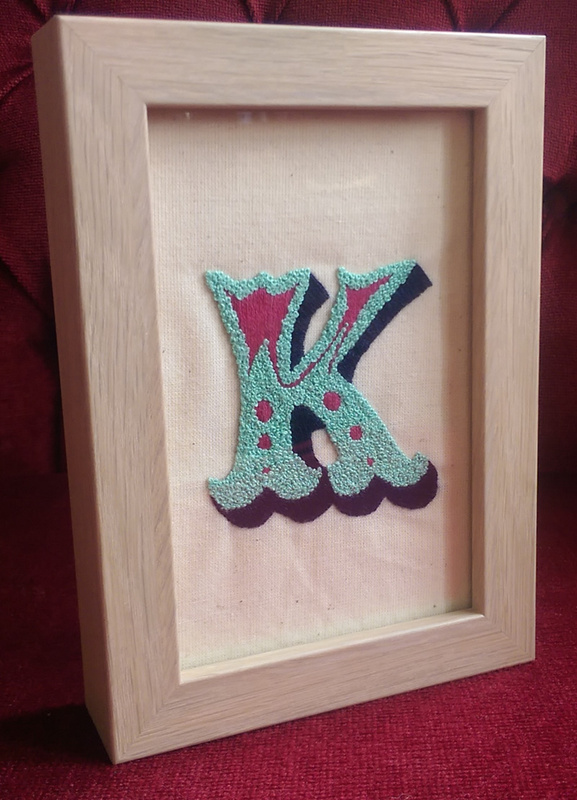 This customer purchased one of the embroidered letters from my Etsy shop – the ‘A’, as both she and her husband have the same first initial. She then decided she wanted their last initial too, in colours to complement the other one. 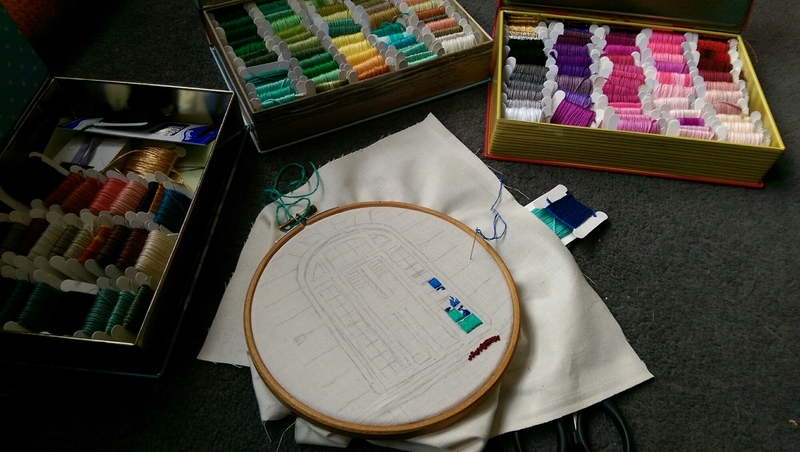 I was very happy to oblige (in a strange, slightly masochistic, way I do enjoy embroidery! ), and I’m chuffed to bits with the finished piece. 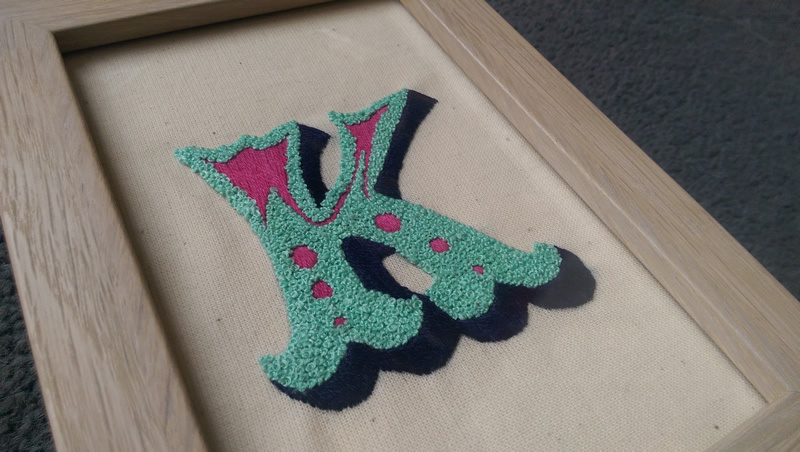 The original letter was pink with turquoise highlights, and this one is the opposite – the shades used on each are slightly different, but they complement each other nicely. 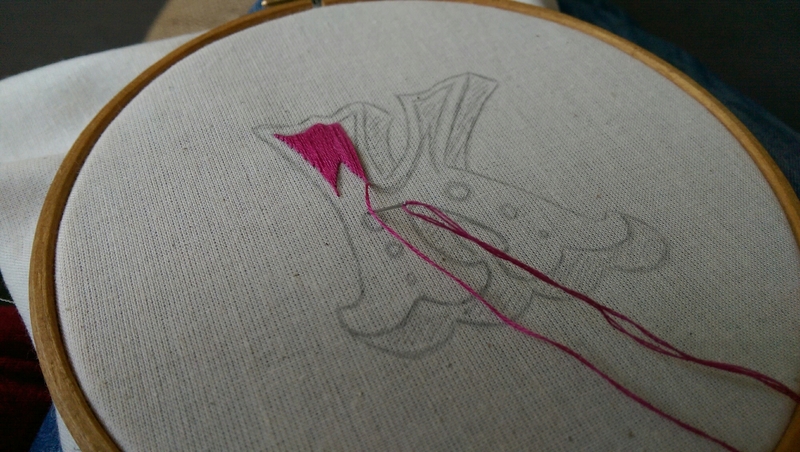 Fun fact: I lost count after the first hundred, but I estimate that there are around 1,000 French knots in this piece of embroidery.